mangiare, cantare ed amare sono i tre atti dell'opera comica della vita. The LAZAGNE project, an idea from Vilco Guermandi, is about the creation of quick serve restaurants that sell only the typical Bolognese baked pasta dishes, lasagna and cannelloni. Their delicious flavours are thanks to the mixture of the meaty classical recipe beside new vegetarian ones with a dash of modern creative inspiration . The roots of this idea go back to the experience gained in the restaurants in Bologna from the ’50s to the’70s, the heyday of Bolognese cuisine! 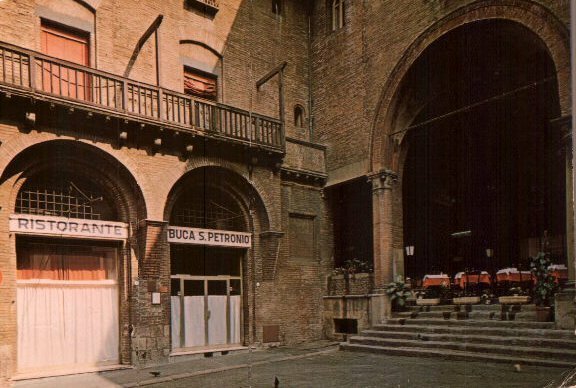 To be more precise… the experience of Clara Guermandi, earned in the kitchen of the famous Bolognese restaurant ‘Cesarina’ in St. Stefano’s Square, then headed by Sig.Palmirani, who went on with other family members to manage the Buca S.Petronio restaurant in Piazzetta della Vita from 1970 to 2004. The lasagna and cannelloni were placed in the oven 30-40min before opening, ready for the first customers, more could be baked at any time according to demand but the delicious baked pasta could simmer in the oven at the right temperature for more than two hours without losing its quality, even reaching its peak of ‘bontà’ (deliciousness) after about an hour of cooking. The top sauce, absolutely separate, was added to the lasagna moments before being served, allowing an excellent quality dish to be ready to serve at all times. Lazagne will follow the same method of preparation, cooking and serving that worked so well for many years because it guarantees a quick meal of exceptional quality at a fair price.